In step 3 of this tutorial, the model, the parts and the visuals are compositions of multiple objects. 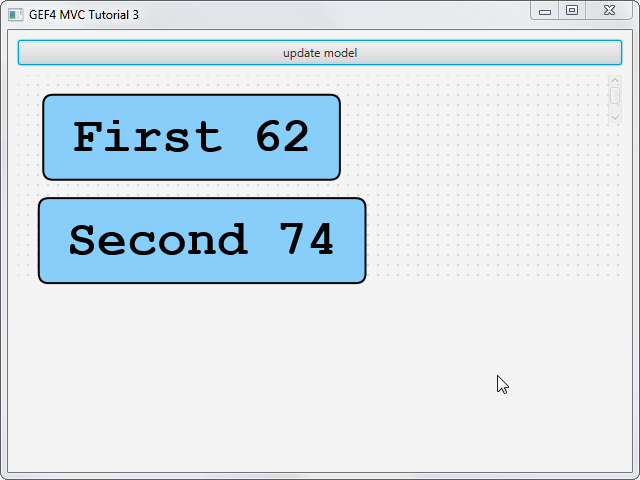 Each model node type is mapped with the ModelPartFactory to a corresponding content part (ModelPart and TextNodePart). For the source of this tutorial step see github - gef4.mvc.tutorial3. The model nodes implement PropertyChangeNotifier. When the model is changed, it can notify listeners. The TextNodeParts register themself as listener, when they are activated. 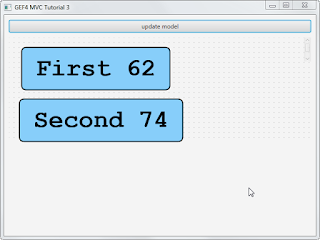 This example has a button on the top, that applies changes to the model. So the text and the position of the boxes is varied.